Movies are not my beat, but I often go to the theater at the Amherst Cinema. The ongoing National Theatre Live series of big-screen, high-def broadcasts from the London stage is a staple of my playgoing schedule. This month and next, the cinema screens encores of five shows in the spring season. I’ve seen two of them in previous screenings, and I’m eagerly awaiting the others. And this Saturday the cinema hosts a one-time, 50th-anniversary showing of a documentary with a glancing but chilling connection to theater. 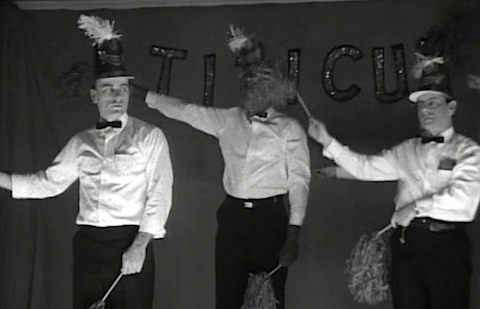 It’s Titicut Follies, the groundbreaking first film by the now-legendary Frederick Wiseman. Co-sponsored by MIFA, the Massachusetts International Festival of the Arts, the screening will be followed by a panel discussion featuring the filmmaker himself. This month’s NT Live lineup features four incisive dramas, each of them a classic in its own right, and a Shakespearean comedy with a twist. 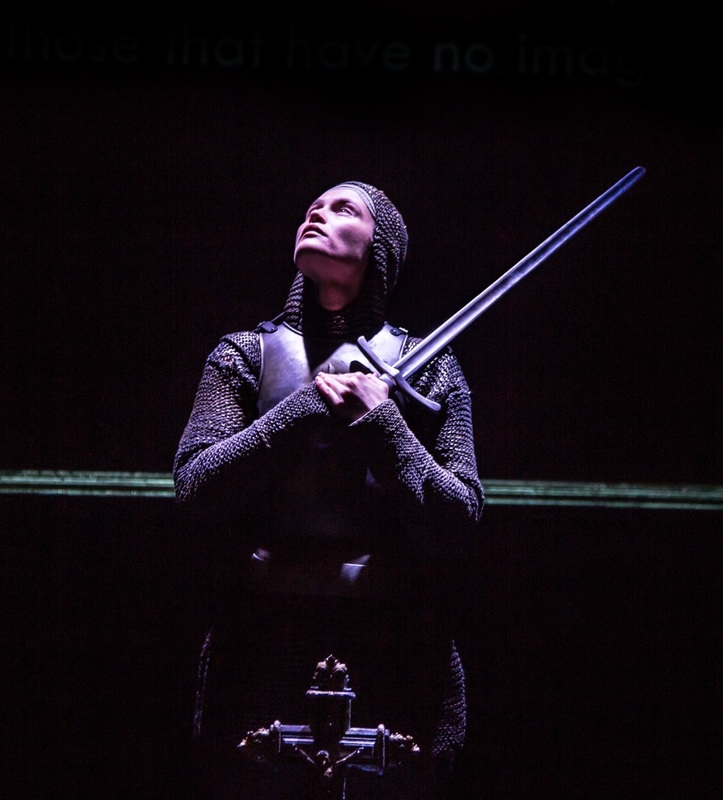 Next Saturday (April 15, 12:30pm) it’s Saint Joan, George Bernard Shaw’s witty and humane portrait of that militant visionary Joan of Arc. Josie Rourke’s production, from London’s edgy Donmar Warehouse, gives the play a split timeframe. Joan (Gemma Arterton) is an authentic 15th-century figure, contrasting with the rest of the cast (all men) in modern business suits, thus emphasizing the play’s thematic timelessness – that is, women’s uphill battle, and in this case ultimate betrayal, in a world ruled by powerful men. On April 19th (7pm) comes another woman in a man’s world, in the person of Henrik Ibsen’s Hedda Gabler. Like Shaw’s Joan, Ibsen’s heroine (Ruth Wilson) is intelligent, charismatic, willful and manipulative, feeling stifled by enforced domesticity but seeking less warlike means to express herself – though Hedda, like Joan, is armed. This production, directed by the auteur-of-the-moment, Ivo van Hove, is set in a white-out of ultra-modern blankness, mirroring Hedda’s bleak alienation. 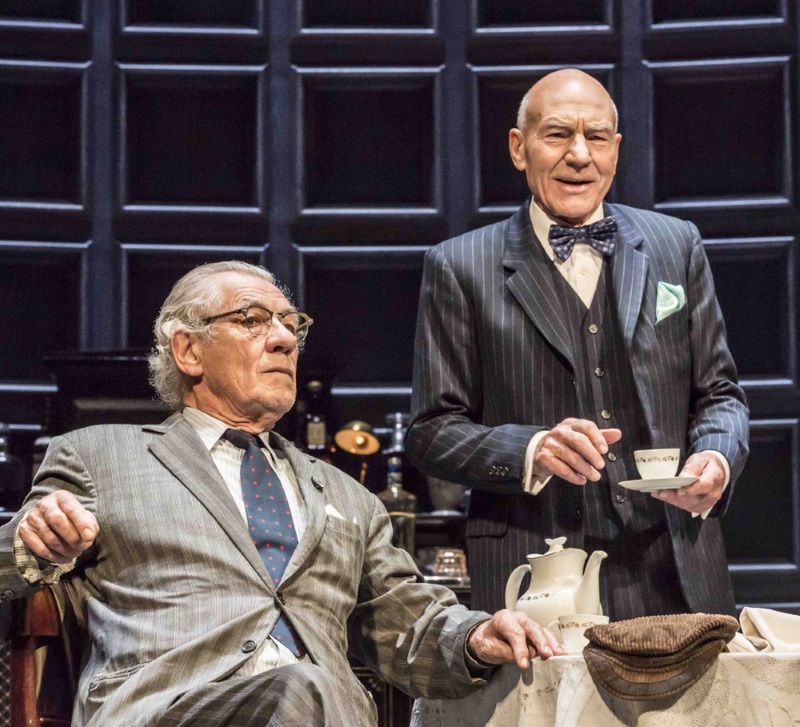 Harold Pinter’s No Man’s Land (April 22, 12:30) is a masterpiece of chilling enigma framed by comic exchanges that sometimes verge on the vaudevillian. 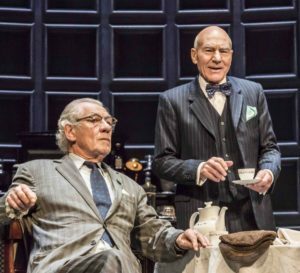 It’s a fascinating piece, but what’s most rewarding about the National’s production is seeing Ian McKellen and Patrick Stewart in it. These old pros are joyously entertaining as they glide through a drunken night-before and morning-after encounter in which it’s never quite clear that they are what or who they say (or think) they are. One niggle: The NT’s multi-camera photography is usually very good at giving us both the full- stage pictures the audience enjoys in the theater and the close-ups available to cinemagoers. But here, in one long, funny exchange in which the two men’s silent reactions are just as telling as what each is saying, the cameras cut back and forth, losing half of the scene’s punch. Peter Shaffer’s Amadeus (April 29, 12:30pm) is a brilliant, caustic study of Mozart and his nemesis, Antonio Salieri. I saw the original production at the National, in 1979, and what I remember most vividly about it is Paul Scofield, as Salieri, cursing God for giving him the ears to hear both Mozart’s genius and his own mediocrity, his words flying upward into the shadowy heights of the cathedral-like Olivier Theatre. This revival is staged in the very same theater to similarly striking effect. 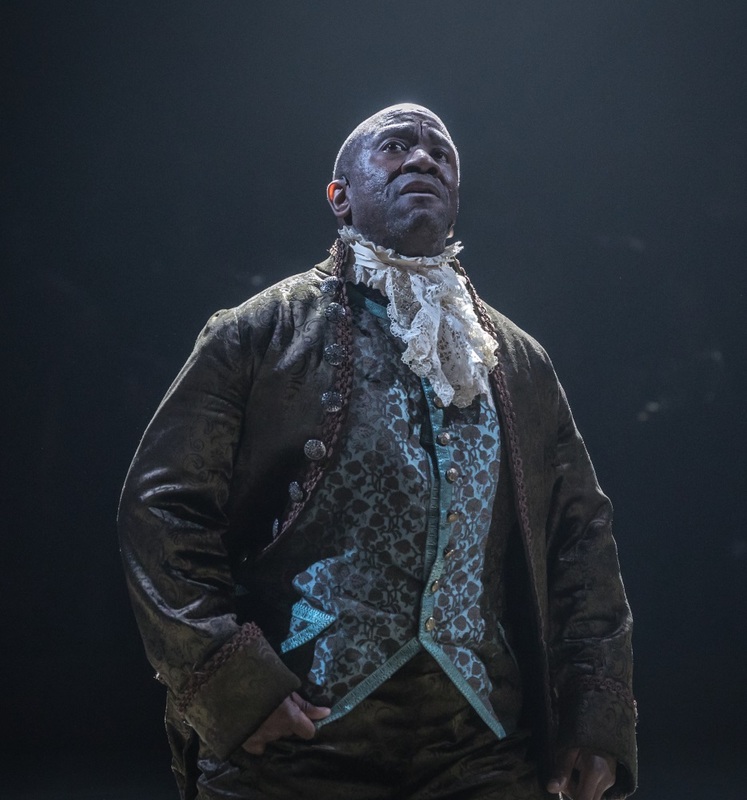 It stars Lucian Msamati as a catlike Salieri, now purring seductively, now silently eavesdropping, now drawing blood with the subtlest of gestures. The sumptuous production features an onstage chamber orchestra that becomes part of the action. My one niggle here is Adam Gillen, who takes Mozart – a character conceived as a juvenile, filter-free brat – to childish extremes and rarely ventures beyond the baby talk. Following the feminist trajectory set by the Saint Joan and Hedda Gabler productions, Twelfth Night (April 27 & May 20) slips a woman into one of Shakespeare’s most famous comic roles. That’s Malvolio, the pompous, lovestruck steward – or rather, Malvolia, played by Tamsin Greig in puritan black and a steely rigid pageboy haircut. It’s an apt switch, as the romantic plot turns on a girl disguised as a boy. As if to drive the point home, director Simon Godwin has set one scene in a drag club. One British critic found the show “full of zest, fun and good performances,” including Greig’s “brilliant” cross-gendered turn.